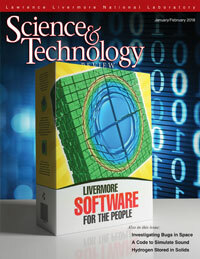 Livermore's culture of open-source software development strengthens Laboratory programs with an engaged user community. A Livermore-developed biodetection system helps researchers survey the microbial population of the International Space Station and evaluate pathogenic risks to the crew. An innovative computer model simulates mechanical waves both underground and in the atmosphere, offering new insight into earthquakes and terrorist blasts. Laboratory researchers lead efforts to store hydrogen in solid materials for advancing fuel-cell technologies.